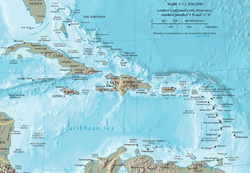 The Caribbean or Caribbean Area (Dutch: Cariben or Caraiben, French: Caraïbe or more commonly Antilles; Spanish: Caribe) is a region of the Americas. It includes the Caribbean Sea, its islands (more than 7,000 islands, small islands and cays, most of them surrounding the sea), and the coasts of north South America and east Central America. Cayo de Agua in Los Roques archipelago, Venezuela. Beach in San Andrés, Colombia. A church cemetery perched in the mountains of Guadeloupe. Asian Indians in the late nineteenth century singing and dancing in Trinidad and Tobago. Temple in the Sea, a Hindu mandir in Trinidad and Tobago. Holy Trinity Cathedral, an Anglican Christian cathedral in Trinidad and Tobago. Mohammed Ali Jinnah Memorial Masjid, a Muslim masjid in Trinidad and Tobago. A Jewish synagogue in Suriname. A Rastafarian man wearing a Rastafarian cap. A Santería alter in Cuba. Doubles, one of the national dishes of Trinidad and Tobago. Arroz con gandules, one of the national dishes of Puerto Rico. Epiphytes (bromeliads, climbing palms) in the rainforest of Dominica. Costus speciosus, a marsh plant, Guadeloupe. An Atlantic ghost crab (Ocypode quadrata) in Martinique. Crescentia cujete, or calabash fruit, Martinique. Thalassoma bifasciatum (bluehead wrasse fish), over Bispira brunnea (social feather duster worms). Two Stenopus hispidus (banded cleaner shrimp) on a Xestospongia muta (giant barrel sponge). A pair of Cyphoma signatum (fingerprint cowry), off coastal Haiti. The Martinique amazon, Amazona martinicana, is an extinct species of parrot in the family Psittacidae. Anastrepha suspensa, a Caribbean fruit fly. Hemidactylus mabouia, a tropical gecko, in Dominica. Caribbean Facts for Kids. Kiddle Encyclopedia.